A consortium of local and regional social justice and interfaith organizations will commemorate the 1963 March on Washington. 6 p.m. Rally & Belltolling at Mount Zion Baptist Church, 1634 Rev. Dr. S. McKinney Ave. (19th and Madison). Free reception featuring a variety of ethnic dishes. 7 p.m. Commemoration program. A diverse group of speakers on current events, spoken word artists and songs. Free parking is available in lots on 19th and/or 20th avenues. 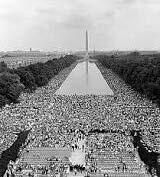 The interracial and intergenerational March on Washington for Jobs and Freedom, held on August 28, 1963, was an unprecedented display of civic activism. Best known for the iconic “I Have A Dream” keynote speech orated by Rev. Dr. Martin Luther King, Jr., the purpose of the March was to address the “twin evils of discrimination and economic deprivation.” The March directed federal government attention to employment discrimination and civil rights abuses against African Americans. The March also supported the Civil Rights Act that President Kennedy was attempting to pass through Congress. Fifty-five years after the March, the United States remains the most socioeconomically unequal of all Western nations and has less social mobility than either Canada or Europe. To champion the contemporary fight for economic and social equity, the 2018 commemoration of the 1963 march for jobs and freedom focuses on access to education, jobs, and contracts for women and for ethnic, racial and sexual minorities. A proposal before the City Council further requests changing the name of MLK Park to the MLK Civil Rights Memorial Park, mounting in the park a plaque honoring local civil rights leaders, and holding an annual celebration to champion local civil rights efforts. Program sponsors to date are the MLK Jr. Commemoration Committee, Church Council of Greater Seattle, City of Seattle, Civil Rights Coalition, Faith Action Network and Mount Zion Baptist Church.